Symbiosis is pleased to offer the Green Season promotions for the HanumanAlaya and HanumanAlaya Villa that began on 1 April 2014. During September our offer is rooms at half‐price, while October has a ‘Stay 3, Pay 2’ promo. 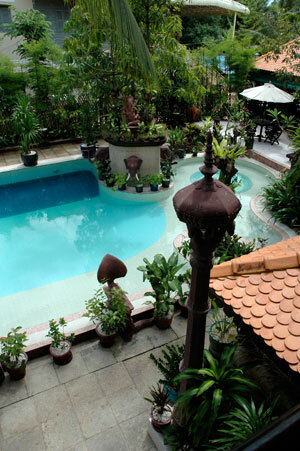 – Stay minimum 1 night get 50% Discount including breakfast. – Stay 3 nights, pay only 2 nights including breakfast. The two HanumanAlayas – the Boutique Residence and the Villa – are located next door to one another just off the road that leads to Angkor Wat, about a 10 minute tuk tuk ride from the centre of Siem Reap – an ideal location close to the action but far enough to offer peace and seclusion. One of Symbiosis’ favourites in Siem Reap. Contact one of our travel specialists as early as possible to book.